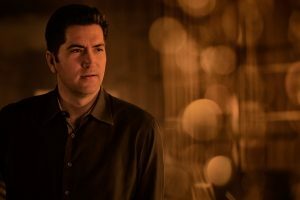 Director Drew Goddard on the set of Twentieth Century Fox’s BAD TIMES AT THE EL ROYALE. ©20th Century Fox. CR: Kimberley French. HOLLYWOOD—Think of “Bad Times at the El Royale” as a more sinister “Clue” set in the remote mountain resort Lake Tahoe. Seven strangers arrive at a rundown hotel. Each of them comes with a dark past. The hotel itself harbors its own secrets. Over the course of a night, each visitor has a chance at redemption, but then things get complicated. The thriller stars “Thor’s” Chris Hemsworth, “Mad Men’s” Jon Hamm, “Fifty Shades of Grey’s” Dakota Johnson, “Crazy Heart’s” Jeff Bridges, “Pacific Rim: Uprising’s” Cailee Spaeny, “Step’s” Cynthia Erivo, “The Strangers’” Lewis Pullman and “The Founder’s” Nick Offerman. Directed and co-written by Drew Goddard, the film keeps viewers guessing as to who’s behind a sinister plot to off the other guests and what dark presence is watching them. Goddard, who previously helmed 2012’s thriller “The Cabin in the Woods” and created the popular “Daredevil” TV series, spoke about the nourish-mystery as did a handful of his cast members. Filmmaker Drew Goddard sets the stage. Q: How do you describe this movie? Goddard: Like everything I do, it doesn’t fit into a simple sentence. 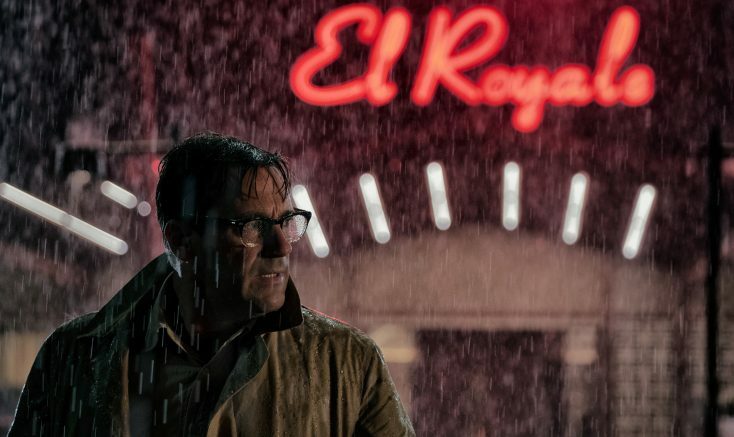 I guess the simplest way to say this is “Bad Times at the El Royale” is a crime thriller (set) in the ‘60s where no one is who they appear. Q: In terms of the casting process, how challenging was it to get this group of actors? Goddard: The casting process was definitely the best of times because this is my dream cast. I couldn’t ask for a better cast. So, everyone who said yes was just a dream come true. Q: Who was the first one you cast? Goddard: We started with Jeff Bridges. You sort of get your benchmark and go from there. Once we got Jeff onboard, everyone else said yes pretty quickly because everyone wants to work with him. Q: How hard was it to shoot a movie about this California/Nevada border town in Vancouver? Goddard: (He chuckles.) It’s hard to shoot in a different place but that’s the magic of movies. We had a wonderful team that recreated California and Nevada flawlessly. Q: Did you have any bad times on the “El Royale” set during shooting? Goddard: There weren’t any bad times during shooting. We had a wonderful shoot. I suppose the worst time was we had a lot of rain in this movie so we were wet a lot of the time and at a certain point we got very cold. I put my poor actors through ****. Goddard: We built the rain. We built the whole set so it could constantly rain. But after four weeks of rain on the actors, they start to get pretty fed up with getting wet. Q: There’s a secret in the film within the film. Who do you think is in that film? Goddard: The truth is if I wanted to answer it, I would have put it in the film. I think it’s intentionally mysterious so people can draw their own conclusions. Q: Could there be a part two for this movie? Goddard: You never know. Absolutely. A woman with a checkered past along with her impressionable younger sister check in. Then in comes a vacuum cleaner salesman. Dakota Johnson, Jon Hamm and Cailee Spaeny discuss their characters. Q: Dakota, could you explain a little about Jon’s character? Cailee, please talk about Dakota’s role. And Jon, how would you describe Cailee’s role? Hamm: Hmm. That’s what they call in the business “flip, flop and fly” in the biz, and by “the biz” I mean “the industry.” So, this young lady (Spaeny) plays a very mysterious person who shows up at the hotel, and we’re not sure what her deal is because she comes under mysterious auspicious. And then she looks like a very naive, young, innocent person, but then we realize maybe that’s not … so … true. Cailee, go for it. Spaeny: Dakota plays my sister, Emily and she is a bad*** whom Em will do anything to protect her family, her little sister, who is me and, I don’t know, that’s it. Johnson: Jon Hamm—you may know him from such epics as “Baby Driver” and “Mad Men”—plays a traveling vacuum salesman who ends up in the hotel, and he may not be who he seems to be. Q: The movie revisits the past over and over again from different points of view. Do you feel like your movies revisit your own past? Q: When you watch one of your old movies, don’t you think your old movies revisit your past in a certain way? Johnson: Like, associate the film with a part of your life? Hamm: Sure. You can’t not. It takes up a long time to make a movie so it’s obviously an experience that … and you meet people and you make friendships, sometimes lifelong friends, and it’s really nice. Q: In the movie, there are people watching from behind a mirror. As movie stars, do you feel like in your own life people are watching you from behind a mirror without you knowing? Hamm: The other thing is when people do this. (He takes his cell phone and waves it in front of him.) And they go, “Oh, I’m just checking my email but I’m really taking a picture of you.” It’s gross. Johnson: It’s totally, totally, totally crazy and wrong. Q: Is there someone in real life that you’d like to watch behind a mirror? Hamm: That’s kind of gross and creepy, so no. But, yes. Dakota’s mulling this one. Johnson: I really am. You think, “ooh maybe,” but it’s all kind of weird. Hamm: It is because it’s super-gross. But still, yes. Q: There’s a secret film in the film. Who do you think is in that film if you were watching this film, because it doesn’t say? Hamm: No, it doesn’t make it explicit but I think it’s hinted. It’s strongly hinted at. Q: What movie of yours would you like to burn? Hamm: No. Even bad movies are good in some way. You’ve had a good experience and you learn. Also, you like to think I’m not mad about any of the movies I’ve done. People like different things. They’re all good in their own weird way. You’re welcome, everyone. Johnson: I could have a nice bonfire with a few of mine. Hamm: I’ve seen your films. They’re very good movies. A priest, a bellman and an aspiring singer walk into a hotel. Oscar winner Jeff Bridges is joined by relative newcomers Cynthia Erivo and Lewis Pullman to discuss their roles. Q: Lewis, tell me about Jeff’s character. Jeff, talk about Cynthia’s character, talk about his Lewis’ character and I want you to talk about her character. Pullman: Jeff’s Father Flynn character is—at least what I know of him and what people should go into it knowing—is he’s a genteel priest staying at the El Royale. That’s all I know about it. Bridges: That’s great. And what I know about Cynthia’s character Darlene—what I learn about her—is that she’s a wonderful singer. That was one of the joys of working on this film is that we hear Cynthia sing all the time. Erivo: What Darlene learns of Lewis’ character Miles is that he’s a sweet boy who’s slightly trouble and needs a bit of help and he’s trying to get things right, really. Q: The movie revisits the past over and over again from different points of view. Is it like your movies, where you revisit your own past? Bridges: For me, personally, that’s how I kind of think of my past—in terms of movies, really. I think how old my daughters were at that time. So that’s how I look back at my past—through my movies. Erivo: Lewis and I aren’t movie stars yet. Bridges (to Erivo): But you want to be. Part of being a celebrity has that aspect of it. Q: There’s a secret film going on in the film. Who do you think is in that film? Bridges: I don’t think we can talk about it. Erivo: There are stipulations of who it can be. Q: Is there a film of yours that you would like to burn? Erivo: There’s a video on me on YouTube where I was singing when I was 13 or something. Bridges: (to Erivo) You want to burn that? Ohhh. For me, (I’d like to burn) a lot of the early stuff. I don’t know. It’s like when you’re a kid. I guess I wouldn’t want to burn any. Lewis: I did a musical and I had one number called “Let Love Grow.” It was in (the stage musical) “9 to 5.” Absolutely not! There is footage on You… uh, it’s nowhere to be found. Erivo: I’m going to look for it today. Q: Why should audiences go see “Bad Times at the El Royale?” Why should people see it? Are they going to have a good time? Erivo: Because you get to experience these wonderful characters, these whimsical, full-layered people living through something and it’s a full, fresh thing that has never been seen before. Why not? Come see it. Bridges: That’s how I feel too. It’s kind of a new movie-going experience. There’s nothing quite like it. It just kind of sits there by itself. Pullman: There are a heck of a lot of reasons to walk into this thing but for anything people should go just to see this opening scene where (Jeff and Cynthia) are sharing this piece of pie. I fell in love with your characters so much in that opening scene, so even if you walk out then you’re going to have a real warm good experience.